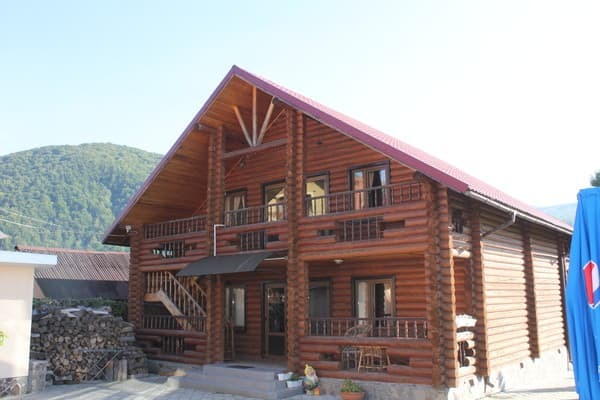 The mini-hotel "Panna" is located in the village of Solochin, at a distance of 25 km from the town of Mukachevo. Each room has a wardrobe. The rooms at the Panna Mini Hotel have a private bathroom with free toiletries. Some rooms offer a view of the mountains. Rooms are also equipped with satellite TV. There is a garden, a terrace, a communal lounge, and a 24-hour front desk. The hotel has its own restaurant. Guests can enjoy breakfast in the mornings. 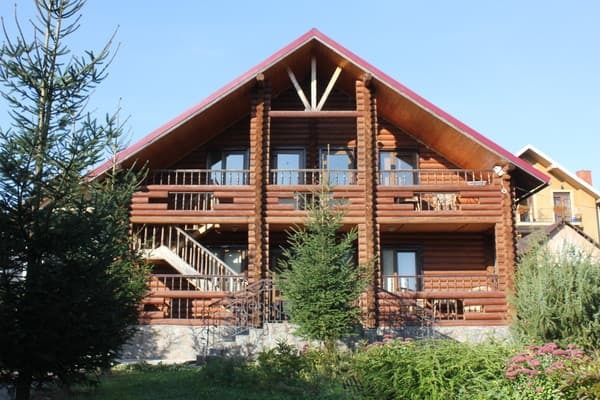 Possible accommodation with animals by prior arrangement, the service can be paid. Near the mini-hotel "Panna" there are walking routes. 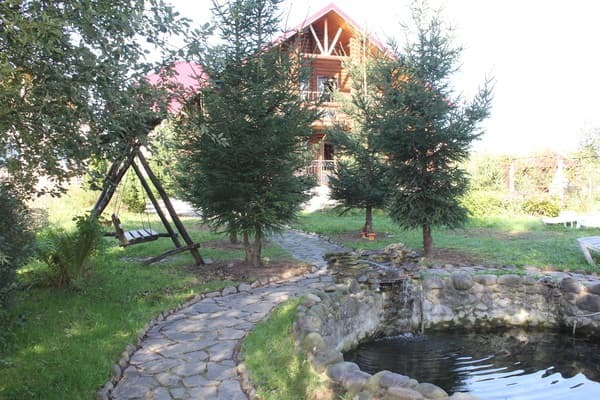 Nearby there is a mountain river and there are several sources of natural mineral water of different types. The village of Slavske is 44 km from the hotel. 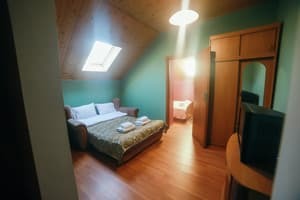 Description of the room: One room in a wooden two-story house, with an area of ​​22 square meters. m., with a terrace. The room can accommodate up to 3 people, taking into account the provision of additional space. Number of rooms in this category is 9. One room in a modern wooden, two-storey cottage with a large terrace, with which, like the window of the room, an incredible panorama opens. A view of the mountains will help to forget about everyday affairs and a bustling city. Nature, fresh air, medicinal water will help restore strength. 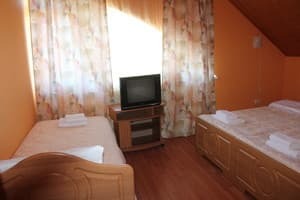 Room facilities: - 2 single beds; - TV stand; - TV; - cable TV; - free internet (Wi-Fi); - electric kettle; - set of dishes ; - Coffee table; - 2 puffs. Bathroom: - shower; - washbasin; - a mirror; - toilet; - towels; - cosmetic products. 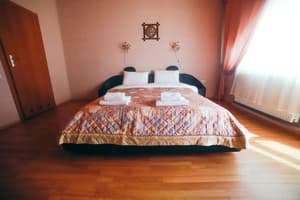 Description of the room: One room in light colors with 3 single beds. 20 square meters. Description of the room: Three-room mansard type in the main building on the second floor. 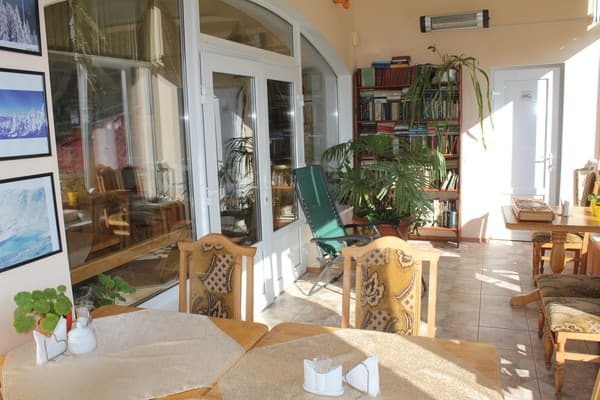 The area of ​​the room is 40 square meters, where a family with 5 people will stay. Amenities in the room have a double bed with bedside tables, a sofa for 2 people, a single bed and 2 TVs. 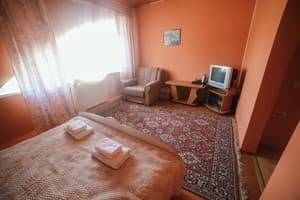 Description of the room: Two-room suite with one bedroom and a living room. In the bedroom there is a double bed, in the living room a folding sofa on which you can accommodate two more people (chargeable service). The price includes breakfast. Check arrival: from 10:00 - 11:00 hours. Check leaving: to 17:00 - 18:00 hours. Children (up to 6 years) without a bed for free. Extra bed 100 UAH. There is a restaurant on site. The price includes breakfast. You can also order a full meal. 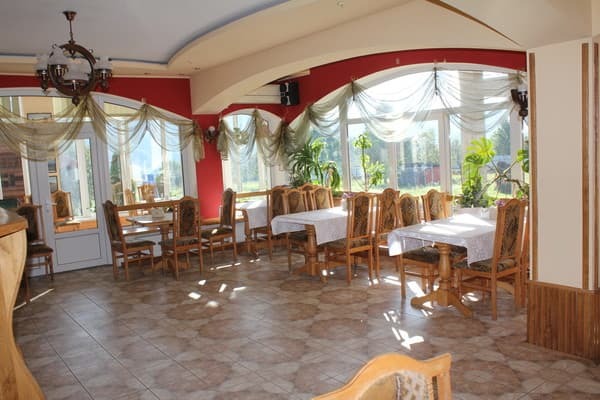 The mini-hotel "Panna" is located at a distance from the city of Mukachevo, 25 km. The village of Slavske is 44 km from the hotel. By public transport - to the station. 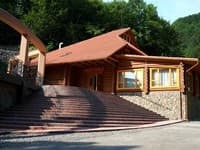 Svalyava by any train in the direction of Uzhgorod, then by bus, minibus or taxi. By car - along the road Kiev-Lviv-Chop (M-06), in Svalyava turn on with. Glade, for with. Pigeon.